Abstract. An established rift in the Larsen C Ice Shelf, formerly constrained by a suture zone containing marine ice, grew rapidly during 2014 and is likely in the near future to generate the largest calving event since the 1980s and result in a new minimum area for the ice shelf. Here we investigate the recent development of the rift, quantify the projected calving event and, using a numerical model, assess its likely impact on ice shelf stability. We find that the ice front is at risk of becoming unstable when the anticipated calving event occurs. 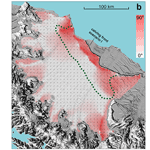 How to cite: Jansen, D., Luckman, A. J., Cook, A., Bevan, S., Kulessa, B., Hubbard, B., and Holland, P. R.: Brief Communication: Newly developing rift in Larsen C Ice Shelf presents significant risk to stability, The Cryosphere, 9, 1223-1227, https://doi.org/10.5194/tc-9-1223-2015, 2015.